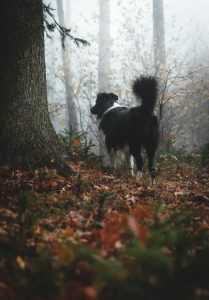 Enjoying walks and exploring the great outdoors is one of the pleasures of dog ownership. Not only is the physical activity mutually beneficial but spending time with pets is great for our mental health and well-being too! 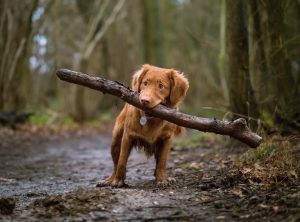 We are fortunate in the UK to have access to great open spaces to enjoy, from Loch Lomond & The Trossachs to Dartmoor, so wherever you are there is somewhere nearby to take a break and have an adventure with your dog! Water & bowl – collapsible bowls or 2 in 1 pet bottle dispensers are a great space-saver. We like this one from Pointy Faces, pictured below! First aid kit – https://www.bluecross.org.uk/pet-advice/basic-first-aid-dogs You might also include a tick twister and some soothing skin salve. 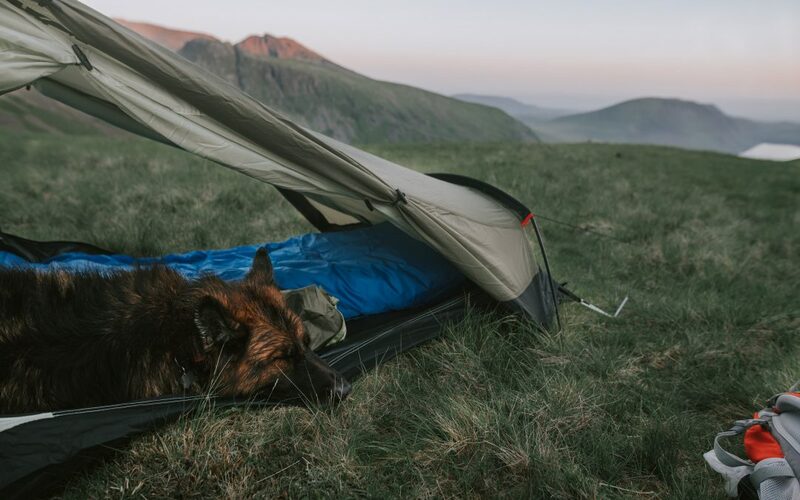 If camping with your dog you might also include a brush/comb, favourite toy and a blanket. It’s also a good idea to take a note of your pet insurance details, just in case! Water bottle for dogs with built-in bowl feature. 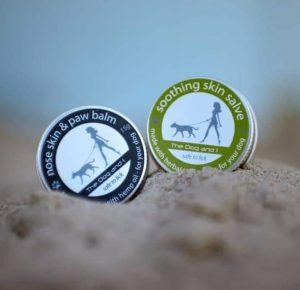 Soothing skin balms from ‘The Dog and I’ for dry paws and sores. No experienced hiker or camper would ever be without a trusty length of paracord! This strong and versatile utility cord is a backpack essential. Developed as a parachute suspension line for the US Army, paracord 550 is a nylon rope consiting of an outer sheath and several inner strands. Also known as ‘survival’ cord, it is able to take a breaking strain of 550 lbs! 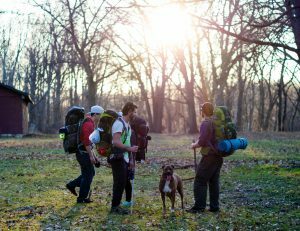 Use it camping for extra guy lines or to secure a tarpaulin, string up a washing line or repair a shoelace. Use the paracord to secure your dog on the campsite. 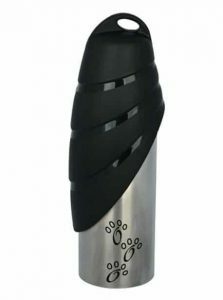 You could use a screw-in ground stake but if the ground is stony the cord can be tied around anything secure enough to hold your dog. And if you’re a serious hiker or wild camper, they don’t call it ‘survival cord’ for nothing… paracord can be used in emergecies as a tourniquet, to make a sling or splint, as a rescue line or to make a ladder, even a pulley system. The inner strands can even be removed to make fishing line and to sew repairs! Paracord dog collars and leads are the perfect accessory for dogs and their humans who love outdoor adventures! They look great and you will always have an essential piece of survival kit to hand. Although it is hoped you will never need it, the Fur Babies single braided dog lead will provide 310” of paracord in case of emergency* (plenty to set some aside for a temporary dog lead until safety is reached) and the double braided lead offers twice as much cordage at your disposal. The Ashton dog collar, made with the cobra knot, uses approx 12” of cord per inch of collar, with the Brunel and Cabot collars using double that amount in their design (King Cobra and wide Solomon bar knots). Besides all the impressive capabilities of Paracord, one of the best things about crafting with Paracord is the range of colour choices! 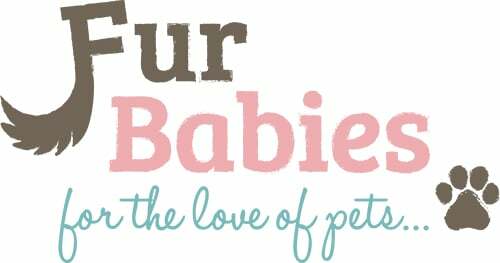 With the Fur Babies collar design service, you can create a collar as unique as your dog and custom orders are always welcome. I hope you enjoy getting out and about wih your dog. It’s a great way to manage the stresses of everyday life. Whether your adventure is big or small, please remember the Countryside Code, be careful around livestock and clean up after your dog. Tag us in your photos to share your adventures and tell us where you have been! 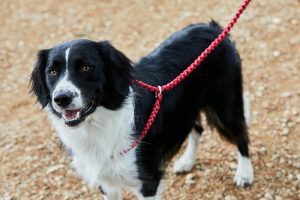 *Please note this requires the unravelling of your paracord dog lead or collar, once undone Fur Babies will not accept returns – this is an emergency scenario! Paracord is tough but please check for wear and tear. Tag us in your photos to share your dog adventures!